As part of our recent website redesign, we have improved our communications to our customers. Previously, we used to send out occasional email updates with one or two machine updates, along with full descriptions. While we will continue to highlight individual products from time to time, we have now begun to send updates to our customers every Friday with 15 Featured Machines. Each machine will have an image, a brief title, and the price. This update is available for anyone who uses our site! Please forward it to a friend who you think might be interested. 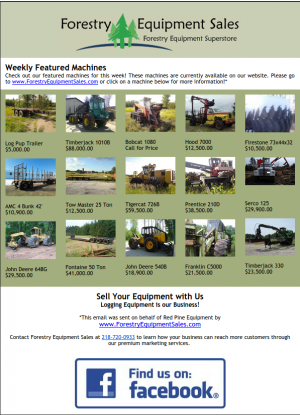 In order to receive machine updates today, just go to www.ForestryEquipmentSales.com and enter your email address in the form near the top right hand corner. Our August 15th Featured Machine Email Update.